Bodyworks is no longer a fringe pursuit—not in a country in which more than 82 million people turn to complementary therapies each year—but it is not without mystery. The range of therapies, or “modalities,” lumped together as bodyworks form the nexus between hands-on energy healing, Western-style body manipulation like chiropractic and osteopathy, and the pleasure and deep relaxation of massage. For some people, bodyworks is truly medically therapeutic, helping them overcome chronic back pain, repetitive stress injuries, even allergies. For others, the payoff goes beyond feeling simply healthy to feeling lithe, strong, balanced—even in mind-body harmony. So, what exactly will they be doing to me? does it hurt? Will the therapist be probing my inner thoughts as she probes my body? Would a skeptic find it too “woo-woo”? How much does it cost? And do I have to get naked? High-minded as these promises sound, bodyworkers agree that most people seek out new therapy when physical desperation drives them to it. “Pain can go a long way in getting someone through the door,” says Joyce Singer, a Boston-based acupuncturist and bodyworks consultant. But something keeps these people coming back after their injuries or illnesses have healed: Like sound nutrition and regular exercise, bodywork can make a big difference in keeping a healthy body healthy. No matter how intriguing the potential benefits are, there are those fundamental questions, those little mysteries, that keep many from giving bodyworks a try. So we’ve taken some of the more prominent, readily available forms of bodyworks and asked those nagging questions for you. Here are the answers. Rolfing (also called Structural Integration) has an image problem: that of a zealous practitioner digging an elbow into a client’s trapezius while said client starts to quiver and frown. But Rolfing’s reputation as a form of bodyworks that’s very effective, though potentially painful, has been changing—the pain part, that is. “People are in charge of their comfort level,” says Beth Franzese, a New York City practitioner who has Rolfed the masses, everyone from a giggling baby who tried to Rolf her right back, to her own mother, who signed up to show interest in her daughter’s work but ended up both more comfortable—her chronic back pain improved—and standing taller. Rolfing’s guiding principle is that body parts do not exist in isolation, but in relationship: A stress or injury in one part can pull an entire body out of alignment. “You get much better results when you look at someone’s whole body,” says Franzese. If a patient has a tight neck, for instance, a Rolfer might trace the discomfort to an injury or imbalance in the foot or lower leg. Having identified misalignments, Rolfers use their hands and bodies (yes, elbows) to penetrate and manipulate fascia, the body’s pliable connective tissue, thereby releasing tension. In so doing, a Rolfer elongates tissue that has become shortened, enhancing alignment and returning the body’s structure to a point of balance. Many clients leave looser and exhilarated, and maybe even a bit taller. Rolfing changes the body’s structure. To help maintain the changes achieved, a Rolfer may provide “movement cues”—suggestions for freer, more efficient movement. What is it good for? Rolfing helps with posture and range-of-motion problems; pain and tightness in the neck, shoulders, and back; knee problems; carpal-tunnel syndrome; repetitive stress injuries; and tension headaches. Do I have to talk? Rolfing “is not a talking thing,” says Franzese. How much does it cost? In the range of $75–$150 per session. How often do I go? A course of Rolfing consists of 10 hour-long sessions, once a week or once every other week. The Rolfing community recommends trying out three sessions to decide whether Rolfing is appropriate for you. Does it hurt? The current philosophy on Rolfing is that if it’s unpleasant, the fascia can be manipulated more gently or approached from a less sensitive part of the body. You can communicate discomfort to a Rolfer, who will adjust the session to your comfort level. When people do report pain, says Franzese, they frequently add that it felt like a relief, or an exhilarating experience. Who shouldn’t do it? People with cancer and rheumatoid arthritis should avoid Rolfing. Will it freak out a skeptic? This is a totally hands-on practice; there’s no theory or philosophy that you have to subscribe to in order to feel its effects. I’m sold. How do I find it? You can find a Rolfer at www.rolf.org. It’s a select group; only those certified by the Rolf Institute in Boulder, Colorado, can call themselves Rolfers. “All roads lead to Rome, but they’re different roads,” says Joseph DellaGrotte, Ph.D., the head of the Somatic Training Institute in Boston, when explaining what distinguishes the Feldenkrais Method from other “movement-reeducation techniques,” all of which seek to enhance the alignment, efficiency, and overall functioning of the body. Whereas Rolfers work directly on the body’s structure to treat health problems, Feldenkrais teachers focus on function, treating what they view as the underlying cause of the problem: inefficient movement. By teaching people to become aware of their daily movements—and the ways those movements could be more structurally sound—it’s possible to rewire the brain, breaking habitual patterns that cause tension or pain. Many people who seek out Feldenkrais have badly designed office furniture and poor sitting or typing habits. “We lose our bodies and can’t find our way back,” says DellaGrotte. In Feldenkrais classes, known as Awareness Through Movement, teachers work hands-on with students lying on a table or a floor mat; the touch is light, and the movement sequences are extremely gentle. Students are guided to move an arm, a leg, or their neck slowly and precisely, and to pay very close attention. And it’s never too late to gain that awareness, says DellaGrotte. He recently saw an 89-year old man, an accomplished pianist whose sciatica left him unable to walk or stand without pain, let alone play piano. After a handful of Feldenkrais sessions, the man started walking, resumed playing, and soon thereafter played 7 concerts in 10 days. “This is a classic example [of Feldenkrais at work],” says DellaGrotte. What is it good for? Feldenkrais helps with back pain, headaches, TMJ, a host of muscular problems, and repetitive stress syndrome. People with cerebral palsy, multiple sclerosis, and Parkinson’s disease have found it helpful, as have those with upper-limb disorders and fibromyalgia. Am I naked? You’ll wear loose-fitting clothing (a relief, in that the practitioner may want to watch you perform some everyday activities and you may find yourself in a classroom with other students). In a one-on-one session, however, Feldenkrais may be integrated with another modality, such as massage or Rolfing, in which case you would likely wear less clothing. How much does it cost? Somewhere around $75 per private session; Feldenkrais is also taught in group settings for about $15 per class. Both take between 45 and 60 minutes. How often do I go? There is no set number of sessions; you will consult with a practitioner to decide what’s appropriate. Keep in mind that “it takes the body time to change,” says DellaGrotte. You’ll leave with useful information about how to move more efficiently and a series of daily exercises designed to reinforce the good habits you learn in class. Does it hurt? No; Feldenkrais is exceptionally gentle. Who shouldn’t do it? This work is without known contraindications. Will it freak out a skeptic? Feldenkrais is very grounded and practical; it is not a mystical practice. I’m sold. How do I find it? You can find a certified Feldenkrais teacher at www.feldenkrais.com. Make sure the practitioner has proven clinical experience—it’s best to get a referral or check someone’s credentials. The craniosacral system—made up of the membranes and fluid that surround and protect the brain and spinal cord —has a rhythm that can be felt throughout the body, says Mary Murphy, a certified Craniosacral therapist at the Advocate Medical Groups Center for Complementary Medicine in Park Ridge, Illinois. By manipulating this rhythm, Craniosacral Therapy eases the cumulative effects of stress on the central nervous system—boosting health and immunity and treating conditions ranging from birth trauma to back pain. In this deeply relaxing work, a client lies on a table while a therapist touches , or “palpates,” the client’s head, neck, and back (and, possibly, legs and feet), feeling for obstructions in the craniosacral rhythm. The therapist uses this information to help release these obstructions, caused by both physical traumas (from falls or injuries) as well as emotional stress that manifests as tension in the body. 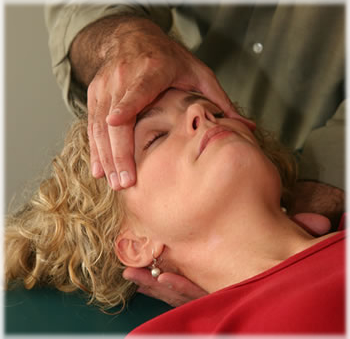 Craniosacral work complements the body’s own healing processes, explains Murphy. “The body of the person being worked on is doing the rebalancing and the self-healing—the therapist is more of a facilitator.” Accordingly, Craniosacral Therapy uses an incredibly light touch—typically, no greater than the weight of a nickel. While it’s hard to believe that something so gentle could be effective, proponents say it’s powerful, versatile work. What is it good for? Chronic pain, headaches, backaches, sinus conditions, allergies, colic, digestive problems; developmental challenges like attention deficit disorder and autism; joint problems, birth trauma, brain and spinal injury, dizziness, eye strain and vision problems, nervous disorders, and depression. It is often used in children to treat hyperactivity, dyslexia, and learning disabilities. Am I naked? You keep your clothes on. Do I have to talk? For the most part, no; the practitioner is most interested in feeling what your body has to say. How much does it cost? $75–$125 per 60–90 minute session. How often do I go? For specific conditions, Murphy recommends several sessions over a short period of time. But people who are learning to “have a better body/mind connection might come once a month, or once a season,” she says. Does it hurt? Releasing tension is a tender business, but for the most part, no. In fact, people often experience a deep-relaxation response. Who shouldn’t do it? This is very gentle work, but anyone who has had a condition that could be affected by a change in intracranial pressure, such as a cerebral hemorrhage or an aneurysm, should avoid Craniosacral Therapy. Will it freak out a skeptic? Whenever someone talks about your “inner physician”—and it happens in this modality—some people will roll their eyes. This is hands-on work, but it’s energy work. I’m sold. How do I find it? Contact the Upledger Institute: www.upledger.com. Shiatsu bodyworks, a Japanese form of massage based on Traditional Chinese Medicine (TCM), works with the flow of chi—energy or life force—throughout the body. Also known as acupressure, shiatsu employs the same meridians, or energy channels, used in acupuncture; it emphasizes the abdomen, or hara, which is seen as the center of the body’s energy system. According to TCM, illness and pain are caused by blockages of chi. By applying pressure to certain points along the body’s meridians, shiatsu practitioners release these blockages, improving the flow of chi throughout the body. Unlike in massage, a shiatsu client is positioned on the floor, generally on a futon—giving the practitioner (often called the “giver”) better leverage, explains Hilde Nieuwenhuysen, a Shiatsu practitioner and teacher at the International School of Shiatsu in Doylestown, Pennsylvania. Practitioners use their thumbs, fingers, palms, elbows, knees, and feet to apply pressure to key points in the body. This modality stimulates the blood and lymph systems, can release endorphins and induce relaxation, and helps “tonify, ” or condition, the body to deal with future stresses. (Tonification is an important principle in TCM). Shiatsu works on the body/mind system as a whole, enhancing health and helping to prevent disease, says Nieuwenhuysen. As with Craniosacral Therapy, the goal in shiatsu is to help the body heal itself. What is it good for? Shiatsu can help enhance mobility and can ease digestive problems, asthma, and depression. It can also help treat chronic back pain, headaches, and neck injuries. Am I naked? Typically, you’ll wear loose-fitting clothes during a shiatsu session. Do I have to talk? Shiatsu is a quiet practice, but the practitioner may discuss what is going on and ask you for feedback. How much does it cost? Shiatsu is generally on par with massage—somewhere between $60 and$100 for an hour. How often do I go? There is no set number of times; you’ll work out a schedule with the practitioner. Does it hurt? Shiatsu can involve a lot of pressure, but should be very relaxing. Will it freak out a skeptic? A shiatsu practitioner may talk about chi, or may just stretch and manipulate you. Keep in mind, though, that while the concept of chi may be unfamiliar to many Western minds, it’s a central principle of TCM, which has been around for thousands of years. I’m sold. How do i find it? The Web site for the American Organization for Bodywork Therapies of Asia, www.aobta.org, lists certified shiatsu practitioners. To understand the up-and-coming modality called Zero Balancing (ZB), think of your body as a sailboat and your energy as wind. When the wind comes from the wrong direction, the boat does not make progress. Like positioning a boat to catch the wind, ZB aligns a person’s body and energy, optimizing health and physical function. ZB bodyworks, which draws from both osteopathy and theories of Traditional Chinese Medicine, works to release energy stored in the bones. “Bone is the densest tissue in the body and can therefore hold the most energy,” says Michael Oruch, an experienced teacher and ZB practitioner in New York City. Energy released from the bones has a ripple effect throughout the rest of the body—tissues, organs, and meridians—says Oruch. During a ZB session, a client lies on a table, face up, while the practitioner moves through the body systematically, pressing firmly but gently into the client’s bones and joints at the hips and legs, along the spine, and on the feet, neck, and head. In so doing, the therapist checks energy flow and releases tension by applying what are known in ZB as fulcrums—balance points that the body reorganizes around. As with many other forms of bodyworks, ZB does not so much heal as facilitate healing: “We’re neither giving energy nor taking it away, but releasing the client’s own energy back to them,” explains Oruch. Am I naked? No; you remain clothed during a ZB session. Do I have to talk ? Before the session you will tell the therapist about any accidents, injuries, conditions, or stresses, but the session itself is quiet; the practitioner wants to feel your energy. “Your job is to relax and enjoy yourself,” says Oruch. How much does it cost? The cost is equivalent to the cost of an hour-long massage in your area. The sessions last 30–35 minutes. How often do I go? The effects of ZB are cumulative, says Oruch. Practitioners therefore recommend that new clients receive three sessions approximately one week apart to begin the practice. Does it hurt? It may cause momentary discomfort as tensions are released, but for the most part ZB is grounding and relaxing. “It should either feel good or hurt good,” says Oruch. Who shouldn’t do it? People with serious illnesses and those with conditions affecting their bones or spine should consult with their doctor before trying ZB. Will it freak out a skeptic? ZB practitioners talk a lot about energy; on the other hand, it is very structural, grounded work. I’m sold. How do I find it? Zero Balancing is expanding in popularity; currently there are over 320 practitioners and 250 others in training. To find a practitioner, call the Zero Balancing Association at 410-381-8956 or visit www.zerobalancing.com.